When Charles Darwin visited the Galapagos Islands in October 1835, he and his ship-mates on board HMS Beagle collected specimens of birds, including finches and mockingbirds, from various islands of the archipelago. At the time, Darwin took little interest in the quaint finches, making only a one-word mention of them in his diary. As painstakingly shown by Frank Sulloway and more recently by John Van Whye, it wasn’t until two years later that the finches sparked Darwin’s interest. By then he had received feedback from the leading taxonomist of the time, John Gould, that the samples comprised 14 distinct species, none of which had been previously described! Gould also noted that their “principal peculiarity consisted in the bill [i.e. beak] presenting several distinct modifications of form”. Seeing this gradation and diversity of structure in one small, intimately related group of birds, one might really fancy that from an original paucity of birds in this archipelago, one species had been taken and modified for different ends. The famously varied beak shapes of the Galapagos finches, as illustrated in the second edition of Darwin’s Journal of Researches. Unfortunately for Darwin, the closer he examined the available evidence on Galapagos finches, the more confusing the picture became. This was partly because the specimens available to him were not sufficiently labelled as to their island of collection. Presumably, it was his doubt about the available evidence that resulted in Darwin making no mention of Galapagos finches in any edition of Origin of Species. Why, then, do people now label them as “Darwin’s finches”, and why are these finches now regarded as a classical textbook example of his theory of evolution by natural selection? Despite not mentioning Galapagos finches, Darwin did make much use of evidence from other Galapagos species (especially mockingbirds) in Origin of Species. As the influence of Origin of Species spread, so too did the evolutionary fame of the Galapagos Islands. Increasingly, other biologists were drawn into resolving the questions about finches that Darwin had left unanswered. By the end of the 19th century, Galapagos finches were among the most studied of all birds. By the mid-20th century, there was abundant evidence that Galapagos finches had evolved to fill the range of ecological niches available in the archipelago – a classic example of evolution by adaptive radiation. Beak size and shape were key attributes in determining adaptation to the different types of food available. In the second half of the 20th century, classic research by Princeton University’s Peter and Rosemary Grant provided evidence of quite strong natural selection on beak size and shape. New light has also been shed on the evolution of Darwin’s finches in a paper recently published in Nature. In this latest research, the entire genomes of 120 individual birds from all Galapagos species plus two closely related species from other genera were sequenced. The work was done by a team led by Swedish geneticist Leif Andersson, with major input from Peter and Rosemary Grant, who are still leading experts on the finches. Comparison of sequence data enabled them to construct a comprehensive evolutionary tree based on variation across the entire finch genome. This has resulted in a revised taxonomy, increasing the number of species to 18. The most striking feature of the genome-based tree is the evidence for matings between different populations, resulting in the occasional joining of two branches of the tree. This evidence of “horizontal” gene flow is consistent with field data on matings of finches gathered by the Grants. A comparison of whole-genome sequence between two closely related groups of finches with contrasting beak shape (blunt versus pointed) identified at least 15 regions of chromosomes where the groups differ substantially in sequence. The most striking difference between the two groups was observed in a chromosomal region containing a regulatory gene called ALX1. This gene encodes a peptide that switches other genes on and off by binding to their regulatory sequences. Like other such genes, ALX1 is crucially involved in embryonic development. Indeed, mutations in ALX1 in humans and mice give rise to abnormal development of the head and face. 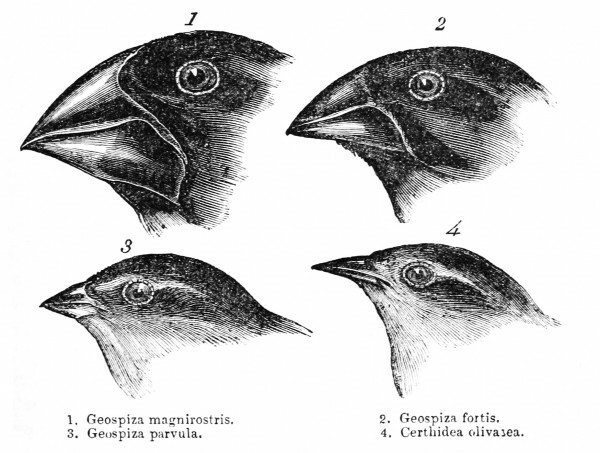 It is an extraordinary illustration of the underlying unity of all life on Earth that Leif Andersson and his colleagues have shown that the ALX1 gene also has a major effect on beak shape in finches, and that this gene has been subject to natural selection during the evolution of the Galapagos finches. If Darwin were alive today, he would be astounded at the power of genomics tools such as those used in generating the results described in this paper. He would also be delighted to see such strong evidence not only in support of evolution but also in support of one of its major forces, natural selection.